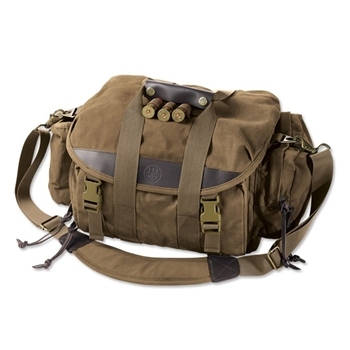 Keep your upland or waterfowl hunting gear dry and organized even in the wettest conditions with the Beretta Waxwear Field Bag. Unlike traditional oil-finished cottons, Beretta's exclusive Waxwear fabric has no oily finish or smell. This durable bag with waterproof flap opening is able to float while fully loaded with six boxes of shells. Packed with plenty of pockets inside and out, the Waxwear Field Bag features sturdy, all-brass hardware; a leather carrying handle; and a comfort-curved, anti-slip shoulder strap. Bag measures 13" x 9" x 9". Imported.